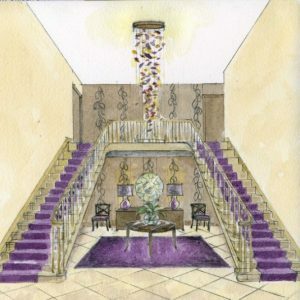 As an experienced Cotswold interior designer with over 20 years of collaborating with clients on their London and country home residential interior design projects, I have designed many unique pieces; including free standing furniture, lights and built in features such as staircases or storage. But why do it and is it worth it? I worked with my clients and their team of architects and consultants over a 3 year period on the interior design of a new £2m country house country house. Traditional on the outside; it had a Cotswold stone gabled exterior. Modern on the inside; with under floor heating, triple glazed sliding doors and open plan layout. The central hub of the house was the Garden room with panoramic views over the valley beyond. To arrive here from the entrance hall or to descend the staircase from the upper floors and be confronted by this magnificent view was a key experience of the house. The staircase design was initially planned by the architect and I then sketched up various design options for the treatment of the balustrade and handrail. 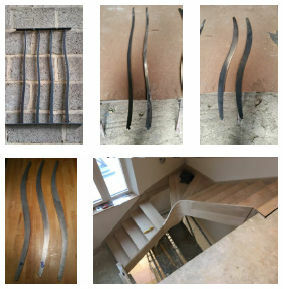 I obtained samples of the possible finishes; sinuous steel curves and an Oak handrail were decided upon. Detail interior design drawings were prepared and I obtained quotes from various manufacturers. The costs varied dramatically from £20 – 60k. Two local artisans I knew were commissioned to implement the work under my watchful eye; one to make the oak treads and curved stringers and handrail, the other was to make the metal balustrade. Gradually the interior design was fine tuned; to water jet cut steel curves with a shot blasted and wire brushed finish, and a final wax polish on site. The client was delighted with the final result and although the process may have taken longer, they have a unique centre piece to their home at a third of the cost of the highest quote. My clients could relax knowing that I was taking care of the technical and aesthetic considerations, which during a complex project with so many decisions to be made is always appreciated. This is part of the personal element of the bespoke interior design services I offer. 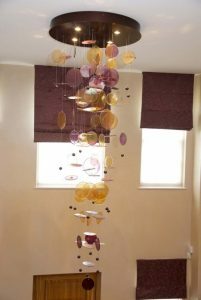 This vast double height space with two staircases was crying out for a central feature to balance the space and create a focal point and it would have been difficult to find a 3m chandelier ready made. 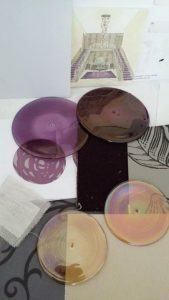 I sketched an idea for a cascade of coloured glass discs in purple, violet, amber and gold – the client was blown away! In consultation with Sans Souci we developed the product and had it manufactured in the Czech Republic. I checked their technical drawings and approved the glass samples they provided and liaised with the site contractor so they could install it over two days. 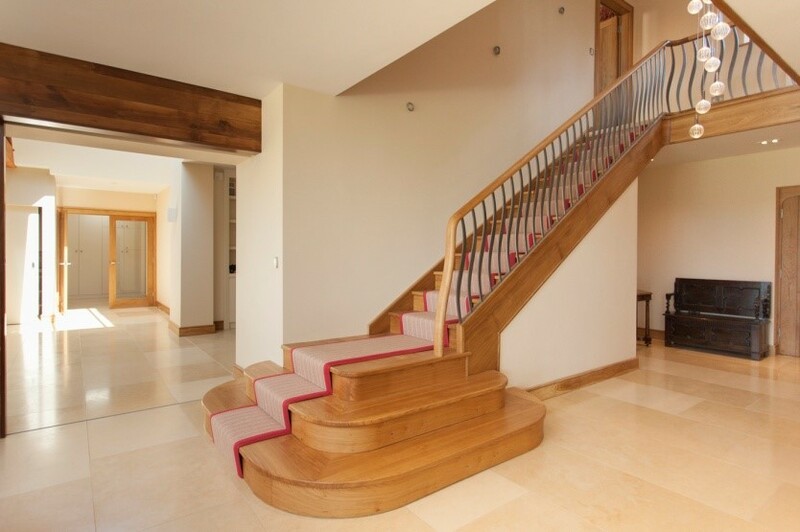 The effect it created was stunning; it is a beautiful focal point as you come in the front door or descend the stairs. And the cost was less than many of the ‘off the shelf’ chandeliers. Most sofas do not comfortably accommodate a family of five and a large dog. Add to that a very large room in which a ‘normal’ sofa would have got lost – this is an ideal opportunity to design a bespoke sofa. The client and I discussed the ideal layout and I sketched plans to show the orientation, TV position and selected fabrics (very hard wearing but soft). Costs were compared with various manufacturers and we settled on a well established British company I had worked with before. They manufactured two corner sofas approx. 3.5 m long which can make one large L shape, with a corner armchair and an ottoman. They had solid beech frames, a sprung base and customised cushion fillings to suit the clients requirements. The result was an incredibly comfortable, well made sofa. It fits the room perfectly and can be re-configured if the family’s needs evolve. Also it did not cost much more than two ordinary sofas. Finally in my extensive experience commissioning bespoke interior design pieces is well worth it, in terms of the cost, style and quality. This is what our service is all about: designing unique bespoke interior design pieces, personally managing the process and implementing it. Click Here to read a press feature about this project.